Last edited by Phoenixsong; 11-02-2018, 02:15 PM. There's a next limit on this event. It would be helpful if this was listed on the description. So bonus is not enough to make people use epics just like last one with nugs. It's an army of Cullens and Josie's out there. Oh so fun. Blighted Fennecs are doing just fine, as they always do during epic events. But shadow nugs are no good, sadly. Btw, ladder rewards are incorrect. The gear on the ladder is not a Certainty, that's for sure. Scout's Quiver, i guess? 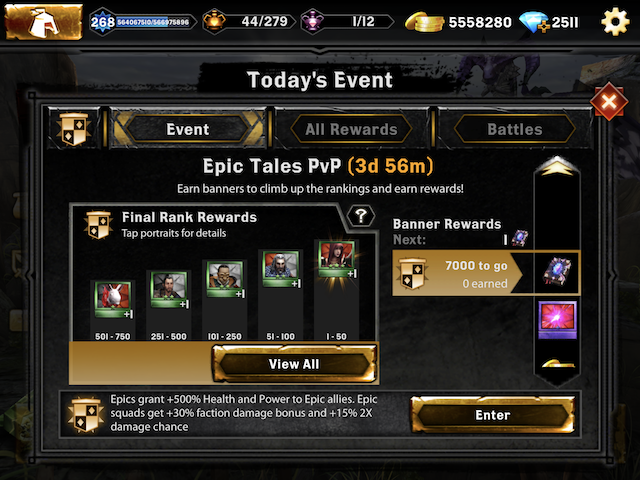 I agree, epics don't work with so low bonus. It's a 3-day event (3d 1h, if you prefer so). I noticed changes in the new ladder: easier to get gems and BP keys, harder to get the object, no iron pack. Not big changes, but I like those adjustments. This is the first event under the new PVP structure. You may notice the rank tiers have been changed as well. Still working on some refinements to the new ladder, namely in the way the gold and xp gets distributed. You should see some improvements to that in the coming weeks. Tap on the "?" for information about the next limitation. Last edited by Lyeshal; 11-02-2018, 12:51 PM. I saw it, really nice! And for first time, no complains in the forum due to the "Next" limitation... it seems to work fine! Like others when a whole squad of epics (fully fortified by epics in every slot) can be defeated by a single Josephine then the bonus is severely lacking. Epics lack effects resist so against any half decent Legendary squad will lose which sort of defeats the object of giving them a bonus. I assume you do run some tests of modestly fortified bonused squads vs the toughest Legendary squads just to see if they can be victorious? Yeah, i kind of agree with everyone else/ I still picked an Epic squad but it's ending up like I'm just nugging lol. Maybe we can have even WAY higher bonuses in the future, enough to easily trample any non-event squads., and I mean TRAMPLE. I do not mind the that from time to time, there are events with next limits and even better, that we do not get punished with banners, when we lose a fight. But still, for me, the dope teams are a big problem. There should be No Dope Event with the Next limit.